The Carbon Dioxide (CO2) + Temperature transmitter CDR 010T is a self-calibrating microprocessor-controlled unit. The Carbon Dioxide (CO2) + Temperature transmitter CDR 010T using an Optical sensor - Non-Dispersive Infrared Detector (NDIR). Carbon Dioxide (CO2) measuring range for the Carbon Dioxide (CO2) + Temperature transmitter CDR 010T is 0-2000 ppm converted into signal 0-10 Vdc. Temperature measuring range for the Carbon Dioxide (CO2) + Temperature transmitter CDR 010T is 0 to +50°C converted into signal 0-10 Vdc. 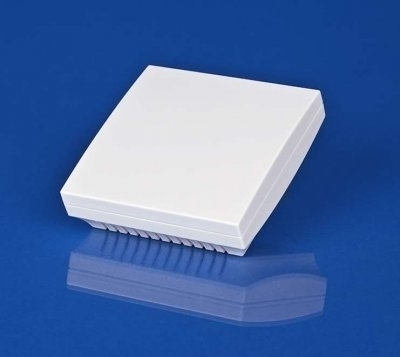 The Carbon Dioxide (CO2) + Temperature transmitter CDR 010T have an elegant enclosure made of plastic, with a snap-on lid, base with a 4-hole attachment for installation on vertically or horizontally installed in-wall flush boxes, with predetermined breaking point for on-wall cable entry. As an option the Carbon Dioxide (CO2) + Temperature transmitter can be supplied in enclosures made of stainless steel (CDR 010T SS), top and bottom part are of stainless steel, the lid is screwed on, vandalism-secure version e.g. for schools, military barracks, and public buildings. The detection range of the Carbon Dioxide (CO2) + Temperature transmitter CDR 010T is calibrated for standard applications such as monitoring of residential rooms or conference rooms. Room ventilation on an as-needed basis, improvement of well-being and customer benefit, increased comfort as well as a reduction of operating costs by energy conservation are only some of the beneficial results of employing Carbon Dioxide (CO2) + Temperature transmitter CDR 010T transmitters.